Is that out of control? I hope not because I can't stop buying them. My "go to" place now that I live in Enid is Ross. "Ross?" you say. But I assure you, if you are patient, you will find some treasures. 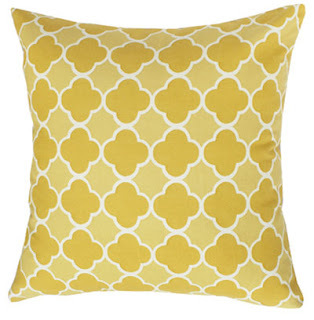 You won't find the gold every time you visit, but when you do stumble upon a gorgeous down pillow for the low price of $10.99, it is a glorious thing. That is where I snagged these bad boys. If Ross doesn't tickle your fancy, you can always find what you're looking for online. One of my new favorite sites is Tonic Living. They have a number of pillows with absolutely stunning fabrics for the less than $25 a pop. Here are a couple for which I currently yearn. Lemon drop keyhole. Yes, please. Canopy stripe. Talk about class and simplicity. 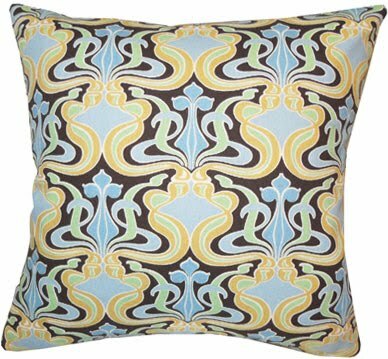 This pattern is one of my current design loves and not just in pillows. But I'll get to that in a later post. Bold patterns like this one add interest to any room and keep the eyes moving. People are often afraid to mix fabrics for fear of their room looking to busy, chaotic or simply not matching, but I say go for it. Layered textures and fabrics are one of the things that can really make a room. As long as you have a subtle background to work with, you can use as many patterns as you want. Take this room for example. There are 3 very different patterns just on this side of the room alone. 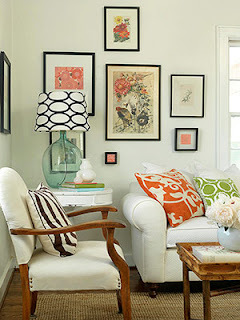 Not to mention the lampshade and framed floral images on the wall. And yet, it works beautifully. Because of the solid, neutral colors on the furniture and rug, the fabrics actually work together instead of compete. 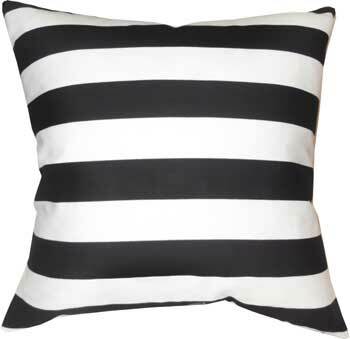 So the next time you're looking to spruce up your room for next to nothing, think of pillows and go bold!